Known as the first hippy hotspot in Goa, Anjuna is a picturesque beach located in the North Goa district in the Bardez Taluka. The beach is in close proximity to Vagator beach and the historical town of Chapora. Anjuna beach is known for its various trance and rave parties and a vibrant nightlife that attracts thousands of tourists each year. While Anjuna is certainly not the prettiest of Goa beaches, it is certainly one of the most famous ones due to its extravagant lifestyle and beach parties. Also famous for its weekly flea market organized by a German since the 90’s, Anjuna is an attraction not to be missed on your trip to Goa. 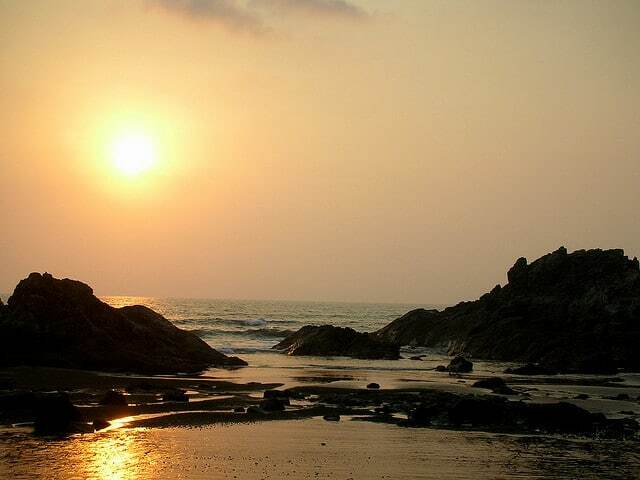 Like most of the beaches in Goa, Anjuna beach enjoys a warm, monsoon influenced climate with mildly chilly evenings. Goa stays warm and sunny during most of the months in the year with the exception of the monsoon season when the rains turn it into a lush green paradise. The summer months lie between March and June with a terrible humidity that can make even the locals sweat their socks off. The monsoons arrive in mid-June and last till the end of September providing a much needed relief from the heat and humidity. The months between October and February enjoy a breezy and sunny weather with chilly mornings and evenings. Any beach in Goa can be visited during any time of the year and you will still find a lot of attractions. Anjuna beach is famous for its hippy culture influenced lifestyle and tons of rave parties during the tourist season. The tourist season starts from October and ends till late February and offers tons of festivities to the visitors. The monsoon season while not very popular with tourists who visit Goa for the sun and sand, is great for exploring the various hillocks and other natural attractions Goa. Reaching Anjuna beach is not a biggie in Goa as transport is frequently available during the day time. It might be a bit difficult to get buses and auto rickshaws after dark but nothing that a cab cannot solve. You can additionally rent bicycles, motorbikes and scooters which are readily available in Goa. Do not forget to experience the Royal Enfield motorcycle which is a craze amongst the tourists in Goa. As the demand is too high for such motorcycles it is always better to rent one out in advance. Fuel is available at petrol pumps and one liter bottles which are sold at a slightly higher price than the petrol pumps. You can also hire a motorcycle rickshaw which simply a guy with a motorcycle that takes you where ever that you require him to. The major attractions at Anjuna Beach are the numerous hippy style night parties that are held here. The beach is covered with several restaurants and bars that will keep your tummy sated amidst all the fun and frolic. You can also visit the historical Chapora fort that is just a few kilometers away from Anjuna. Alternatively you can also visit the nearby Vagator beach which follows a comparatively laid back lifestyle compared to the party mad Anjuna Beach. The flea market held here every Wednesday is a great place to buy some cheap souvenirs, jewelry and clothes. Apart from this you can also check out the Ingos Saturday night market and Mackies Saturday night bazaar for more stuff.